We love the changing of seasons, especially Autumn! The smell in the air, the crisp weather, the falling leaves, and apples aplenty! We started adding an apple tasting tree to our classroom every fall! We buy as many different varieties as we can find. For each apple variety we taste, the kids color an apple-shaped paper to match and tape it to our tree. This is a fun and tasty way to learn about apple varieties! This activity can be done alone or after reading a wonderful apple book. Here’s a few of our favorites! 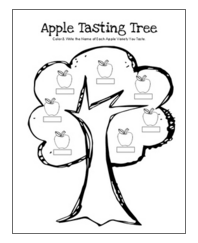 If space is an issue, I’ve created a FREE Apple Tasting Tree worksheet for your students to use as their own personal apple tasting trees! Click here to download from my TPT Store! < Previous “The Carrot Seed” FREEBIES!! !